Feel free to leave a comment below. Comments are oldest first so scroll down to see the newest ones. I prefer contact through the email address as seen above. Please use a subject line that will catch our eye specific to the reason of your contact. We’d love to hear from you. As I am drifting away from the film world and back into the on stage acting situation – that does not mean I am opposed to proposals for film projects. I still accept proposals through proper channels. Email me first before submitting articals and scripts. Yes, I am a busy person. All that means is you should be proactive to catch me. I am writing 100-word biographies of the 30 photographers who have photos in a photobook about JFK forthcoming from Taschen. All I have found about your life and career is that you were on the Newsweek staff. Any chance you could point me to some basic bio info such as the year you were born, when you worked for Newsweek, and when you photographed JFK? I look forward to hearing from you at your earliest convenience. If you’d like to talk on the phone, let me know a good day, time and telephone number to reach you. 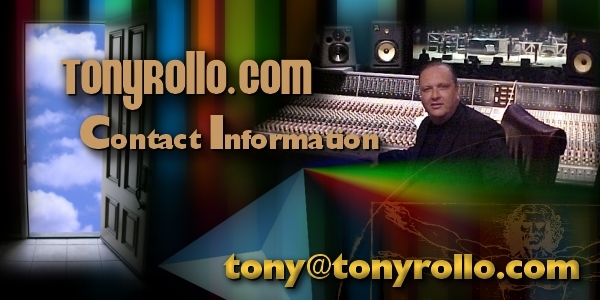 I am the Tony Rollo who is the Nashville Producer. The Tony Rollo you are no doubt inquiring about was quite a great photographer and had photos regularly in Newsweek, Time and a lot of Associated Press releases. His main time of fame as a photographer was in the 1960s and 1970s. He is long passed on. He would be over 110 years old today if he was still around. I get inquiries a couple times a month about those great photographs of his. I sometimes get confused with him as listed in the JFK Library archives. I first learned of him in a school art class in the 1960s as we were cutting up old magazines making collages and other kids saw my name under a lot of the photographs! Although Newsweek is under new ownership, they should have information on file. You should also contact the Associated Press HQ. Also a good bet – Newsweek was bought out by The Washington Post back in 1961 so you should contact the Washington Post. Newsweek was sold in 2010 and is now only a wisp of what it once was. Your book sounds great and I will no doubt be looking for a copy of it. I also love books on the Taschen label. I like how they have honed out a really cool niche in the book industry. Hey Tony, How have you been? It’s been a few years since I was up in Nashville for a Film Nashville meeting. I’m still writing and shooting photographs. Are you doing audio-books now? I’ve got 3 novels that I getting ready to publish as e-books. I’m interested in the various services that your company offers. Thanks for the contact. Glad you’re still into it. I still remember a lot of stuff I learned from your book – especially the lemonade story. Yes – I’m doing a lot of audio work with releases on CD. Also working on a feature movie about submariners that will be in theaters soon. I’m sure all the info about it will be posted here on this website with links and all. Connect with me directly and I’d be glad to help you out. Interesting that you knew Tony Rollo from Newsweek. So, my wife Jeanine “Rollo” is the grand daughter of the Late Tony Rollo from Newsweek. As a matter of fact one of my kids just did a report about him in school, the pictures and memorabilia my wife and I have are beautiful candid shots of some of The Beatles and their first time in the USA wearing Tony’s hat and holding his camera cases. Anyway, my wife is writing to Ed Beem to see if she can help in anyway. A few years have passed now but anything she can help with she will. Nashville Producer? How did you know about Tony Rollo? Thanks so much for your information Frank ! Great to know your wife is the granddaughter of the professional photographer Tony Rollo who had so many photo credits everywhere in the mid to later 20th century. I sure would like to know more about his life and works. Sharing his name and getting inquiries about photo rights have been a little spooky sometimes. It would be great if i knew exactly where to steer them. I sure get a lot of emails regularly asking for permission to use certain photographs. I always explain and can only send them to inquire with Time and Newsweek as I understand he did a lot of “work for hire” work for those magazines. I first came across a photo credit in Time and Newsweek magazine in an art class around 1969 or 1970. I was in the 5th or 6th grade at the time and we were learning to make collages using old magazine back issues. A buddy of mine in the class showed me a photo with my name under it (actually HIS name but also MY name). That was so weird to my young self at the time. Later I learned what a “photo credit” was and I coincidentally shared the name. No – I never met him. It would have been great if I could have back in the day… I was quite young when he was at his prime. I got into photography myself in my teens in the 70s. Being able to absorb some tips from him by just watching him at work would have been a real highlight for me back then! I sure would like to speak to your wife one day so I can learn more about the guy. There isn’t anything I could find on the internet on Google about him… just a few references to photos involving Newsweek Magazine. I do understand he hasn’t been with us for quite some time. Thanks again for the info – keep in touch! I thought you would like to know, it looks like you’ve misspelled the word “thier” on your website. Silly mistakes can ruin your site’s credibility. In the past I’ve used a tool to keep mistakes off my website. In what dictionary is the spelling “thier” the proper spelling?!? … also on using your spelling of “thier” in proper context in your mastery of English? Also – could you please indicate where did we make our error in the first place? Is English your NATIVE language?!? This is my personal website. So please understand it is a place where i place news, articles and posts directly from me about personal matters and observations. While I invite your comments, this website is not for posts and articles outside of my own works. If you would like to contact me directly at my email address and provide some samples, I would love to review and attempt to place them in an appropriate channel. I enjoyed reading your update on Joe Babcock published in 2018. I have been his CPA for several years, and I must say he is a fine man. Do you own that poster you featured in the article? “Cowboy” Joe Babcock is one of the finest men I have ever been privalaged to know. A man of true integrity that I could never equal. Also – he is someone who could have demanded a place of glamor in the entertainment industry but choose to be in the background. He was a tremendous influence in the Nashville music fabric. There is nearly not a hit song from Marty Robbins in the 1960s to the biggest hits in the 1980s that he arranged the vocals and sang backup. He is a true musical institution. He also is a fine guitarist where I had many opportunities to jam with him and was quite schooled by his talent in a friendly back and forth keeping up with his amazing chops. His family gave us a baby shower back in the day – he lent me his personal car when I had a break down once … I cannot say enough good things about his family and his great being as a true gentleman.